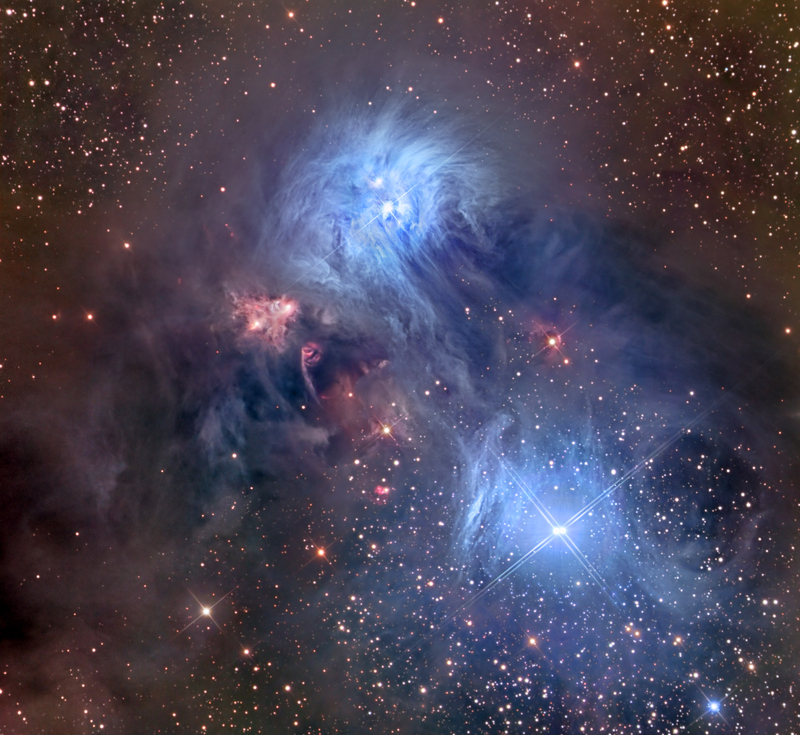 NGC 6726 is found in Corona Australis, a southern constellation. It’s an amazingly complex region of space that gives rise to a veritable plethora of colors, shapes, and textures — a feast for our occipital lobes! Technically, “NGC 6726” is a woefully incomplete description of this region — the upper (blue) reflection nebulae are designated as NGC 6726-6727, while the lower reflection nebula is known as IC 4812. The smaller butterfly shaped reddish-yellow nebula is referred to as NGC 6729. Several small red zones are better known as Herbig-Haro objects — high energy jets from young stars. The thick dark nebula off to the left (that suffocates most of the starglow from within) is called Bernes 157, and a similar area towards the right is called Sandqvist-Lindroos (SL) 41. Data was acquired by SSRO at CTIO in Chile in June 2017 using an FLI 16803, RCOS 16″ @ f/11.3, and a Planewave 200HR mount. This is an LRGB using 30 minute subframes, totaling about 20 hours Luminance, 14 hours Red, 14 hours Green, and 14 hours Blue data. Processing was accomplished using Maxim for data reduction, PixInsight for star alignment and integration, and Photoshop for everything else.